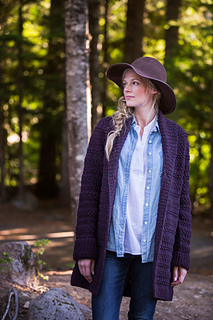 Wrap up in contemporary fall style: a swingy open-front coat knit from cozy Quarry. The original crosshatch stitch pattern, worked from a chart and easily memorized, forms a fabric with bands of deep texture. 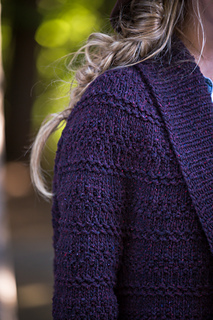 The body is worked flat in one piece with decreases shaping a gentle A-line; long sleeves (designed to be cuffed back) are knit in the round and then joined to work a circular yoke. 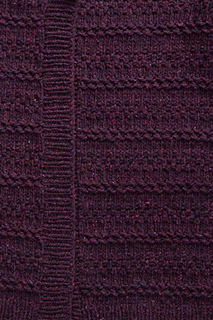 The front bands and collar are picked up and knit in single rib, with short rows shaping the collar. 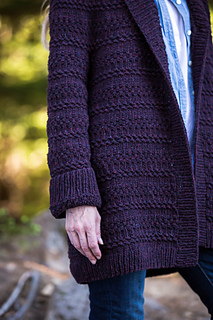 A single toggle allows you to close the fronts if desired. 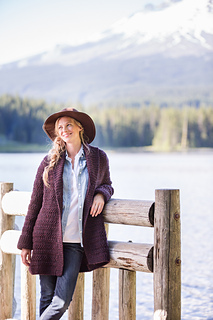 We styled Bannock with 9” of ease; choose a size that gives you 4-6” of ease for a more traditional fit. 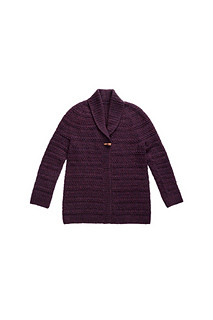 Worked in Hematite, this coat is plum autumn splendor; try it in Lazulite or Gypsum for urban chic.